Finding a contractor to complete your hardscaping in Garner isn't hard, it's finding one you can trust to get it done right that's tricky. Residents and Business owners often choose Jason's Quality Landscaping, Inc. as the reputable provider in the Garner area for landscape construction. Because most of our business comes from referrals from happy customers, we understand that reputation is important, especially when it comes to landscape construction jobs. You want a company who can complete the job correctly and efficiently and with fairness. Jason's Quality Landscaping, Inc. will come through. With many years in the landscape construction business, Jason's Quality Landscaping, Inc. knows how to do the job right the first time! Now that you've found a reputable company to handle your Garner hardscaping project, put our experts to work helping you design your space. Whether you need a retaining wall to manage runoff for a hilly lawn, or you're looking to create a beautiful walkway with pavers in your Garner lawn, we'll be there to guide you every step of the way. 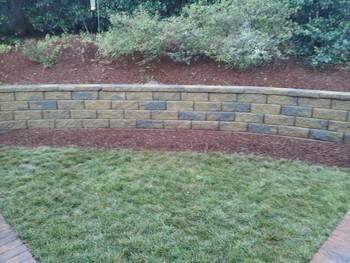 At Jason's Quality Landscaping, Inc. we understand that you are working within a budget. Jason's Quality Landscaping, Inc. provides beautiful landscape construction work that is top quality at an affordable in price. Jason's Quality Landscaping, Inc. will help you meet all of your Garner, NC landscape construction goals, and make your yard look as you have always envisioned it. Contact our quality Garner landscapers today at (919) 214-9134 and we will provide you with a free consultation regarding your future landscape construction or hardscape project.